Just as with any profession, writers need the right tools to succeed. You might assume that means a writer can pick up just any old word processing program and be good to go. However, as writers juggle notes, revisions, re-writes, even plot lines and character beats, organizational help can become a writing program’s most valuable asset. 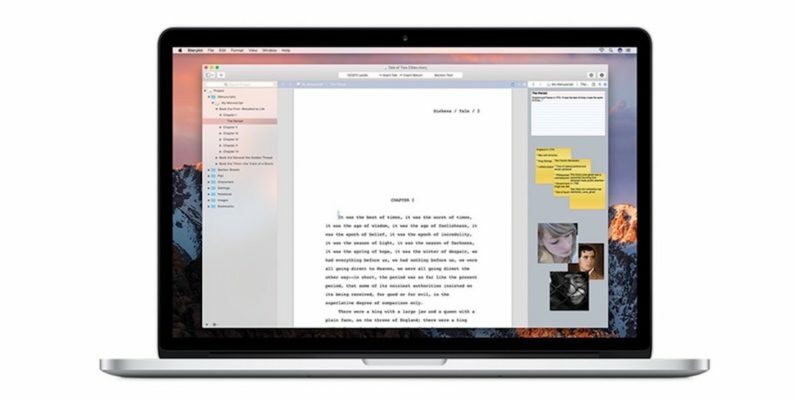 Storyist for Mac is a word processing app seriously loaded with powerful features to help pull together and streamline the entire writing process. Right now, you can add this all-purpose tool to any writer’s arsenal for just $19 (67 percent off) from TNW Deals. Storyist is a winner with writers because it’s a clear, clean approach to breaking down a story and making sure nothing gets lost in the process. With templates customized for different writing formats like manuscripts or screenplays, you’ll start with a solid base to start assembling your work. WIth Storyist, you can either jump right in and start writing or meticulously plot out everything before word one. You can create and save style sheets, use Index Cards to map out your story, put together Story Sheets to track your tale’s plot, characters and settings, integrate visuals, and more. You can automatically jump between different story elements with a keystroke, auto-complete standard scene instructions like introductions, locations, times and character names, or use Outliner to take a step back and get a wider overview of your full story. When you’re finished, Storyist will even export your work in popular script forms like Final Draft FDX and Fountain so you can more easily share work with others. Best of all, Storyist syncs seamlessly with mobile devices like your iPhone or iPad. Just save your work in an online storage service like Dropbox and you’ll be able to jot notes and make additions to your original piece from your phone or tablet anywhere at any time. We all know somebody itching to write a book or knock out a screenplay. Now, you can help them along with this full-service storytelling asset that usually costs $60, but is available now for just $19.